Blimey! You and your blokes have been banished and stripped of everything but a few shillings and table scraps. Undaunted, you journey to a strange land to reinvent yourself and reclaim your honor. Will you farm the earth, fight as knights or finagle your own feudums? 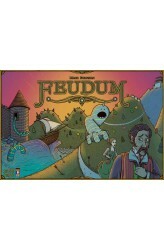 Feudum (latin for fiefdom) is an economic medieval game of hand and resource management for 2-5 players. With many strategies at their disposal, players optimize four actions per turn in attempt to score the most victory points over five epochs. Each player controls several medieval characters that roam the countryside tending farms, taxing towns and taking outposts in effort to rise in power. But that’s only the tip of the behemoth's horn! You will also compete to acquire coveted feudums, which increase y..